The Samsung Hall opened in January 2017 and it is the perhaps most modern high-end event location in Switzerland. 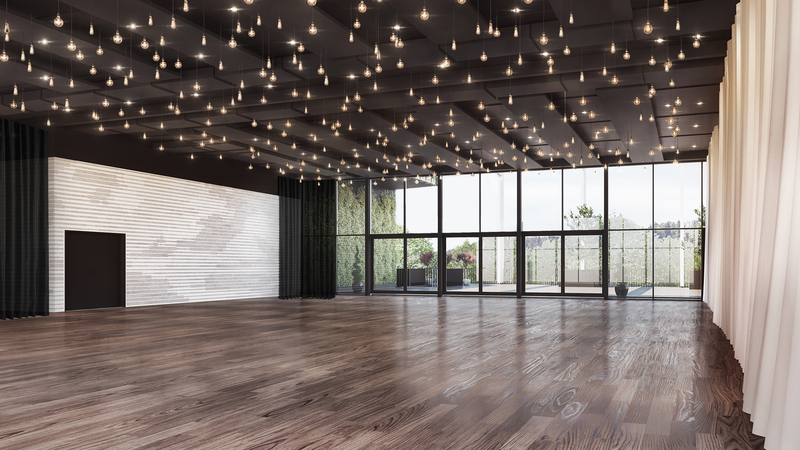 The modular hall impresses not only with its original architecture, it also offers multifunctional rooms that can be adapted to the most different events of all sizes. So you may celebrate with small groups of 50 people as well as with 2,000 people in intimate atmosphere in Dübendorf near Zurich. Whether you want to host a conference, concert, award show, seminar, gala dinner or general meeting, the Samsung Hall offers your individual event a suitable setting. On a total area of more than 4,500 m2 even more than 5,000 people find enough space in the three rooms HALL, LOFT and CLUB as well as on the areas of the terraces or foyers. The centerpiece of this venue is the 2,000 m2 measuring HALL which offers 5,060 people space at seated and standing events. With banquet seating you may invite 1,552 and with gala seating 1,056 guests. Benefit at your business events, social occasions or private celebrations from our modern infrastructure with hydraulic, six times divisible stage (18x10 m) and telescopic stand as well as the three times divisible 120 m2 LED screen. Here you can expect state-of-the-art sound, light and video technology and an innovative rigging system. The LOFT with its 490 m2 and 5-m-high ceilings is ideally suited for effective conferences, seminars or general meetings with up to 660 people. The light-flooded loft can be separated into two rooms and provides a discrete entrance, a foyer (245 m2) and a 440 m2 large terrace. The package offerings for seminars at the LOFT include a beamer, screen, WLAN (fibre optic network is available in the whole building), moderator´s case as well as catering. For general meetings we suggest a separate flat rate that includes further services and technology. We gladly inform you about our offerings so that you will have a stress-free business event according to your wishes. The CLUB is on the second floor and it offers 500 m2 for up to 800 people. You can reach this venue straight from the underground car park. The club with its urban flair is ideally suited for private parties. You may use the mobile bar, a stage, an audio system and a mixing console on site. The Samsung Hall is near to the train station Stettbach and therefore easily reached with public transport but it also offers 250 parking spaces on site.